We are planning a Rally At Queens Park! Please register to make sure you have a seat on the bus! There will be 2 Buses leaving from Region 1 on October 23rd and arriving in Toronto approximately 11:00am. These are the routes and stops along the way. -The Windsor Bus to stop in Chatham at Bloomfield Rd & 7th Line West in the car pool lot South of 401 (hope this is enough info) – This bus to stops in London as well -1092 Dearness Dr for Food and possible Passengers. 2nd bus will stop in London for Food pickup and possible passenger pickup. 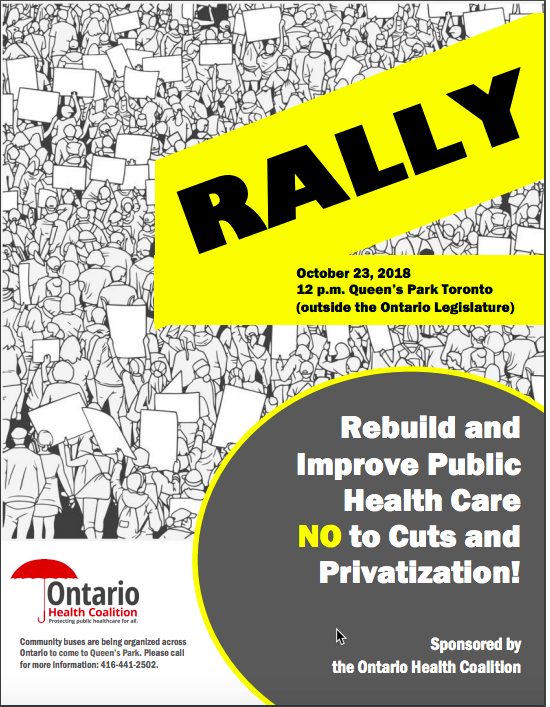 The buses will drop our members off at 585 University Ave in Toronto for a quick OPSEU Meeting and Rally and than make our way to Queens Park half a block away. Thank you and we are looking forward to a great rally with all of the other Regions!! If there are any questions or you think of something else please call. If NO member pick up in London the bus does NOT need to stop in London on way home.